Amari Cooper's touchdown was overturned after the officials made the correct call on the field. The national championship was decided Saturday. And your winner is … instant replay. If you’ve ever wondered how much of an effect instant replay has on football, all you have to do is look at the end of the Alabama-Auburn game. No matter how you look at it, replay decided who is going to play in the SEC championship and, more than likely, who isn’t going to play in the national championship game over what I think amounts to 2/10ths of a second. Here was the situation: Alabama had the ball, third-and-1 at its own 38-yard line with seven seconds left in the game. Alabama quarterback AJ McCarron handed the ball off to T.J. Yeldon, who ran for 24 yards to the Auburn 38-yard line. It appeared time had expired. Alabama coach Nick Saban lobbied to put one second back on the clock. After a review, the replay official agreed, giving the Tide one more play. Alabama’s Adam Griffith attempted a 57-yard field goal that was short and fielded in the back of the end zone by Auburn’s Chris Davis, who then returned the ball 100-plus yards to win the game as time expired. Let me start by saying the replay official, who I think botched two earlier calls in the second quarter (more on that below), got this one right. Yeldon went out of bounds and his foot touched the ground just before the clock turned to zero. There still was one second on the clock just as the foot touched. By rule, since the clock is reviewable on the last play of any quarter in college football, the replay official did the right thing and put one second back on the clock, which led to the kick and Davis’ dramatic return for a touchdown. I’m talking 2/10ths of a second, folks. To the human eye, there was no time left as Yeldon went out of bounds. Long before replay was put into football, the game would have gone into overtime and nobody would have said a thing. But nowadays, with the technology available, it’s all about getting everything precisely right. When it comes to the clock, that includes tenths of a second. I give credit to the replay official, who did get this right. This call had a much greater effect on the game than his two botched calls earlier in the second quarter. All I can say is — wow. The effect of replay is enormous. Rivalry Saturday is about grudge matches. You had Michigan-Ohio State, Georgia-Georgia Tech, USC-UCLA and the mother of them all Saturday — No. 1 Alabama vs. No. 4 Auburn, a dramatic victory won by Auburn on the last play of the game. And just like the schools that squared off against one another, I have also have a grudge — against replay officials in college football. After seeing two replays in the second quarter of the Alabama-Auburn game, my mind is made up in college football: Either give the referees a sideline monitor so they can have input, or, even better yet, move all replays into the command center of each conference. Each major conference has a command center. You can follow what the NHL does or copy what Major League Baseball is going to do, but put all replays in the command center and have supervisors make the decision. Have those that are trained in replay — no more than two guys — make the decisions. 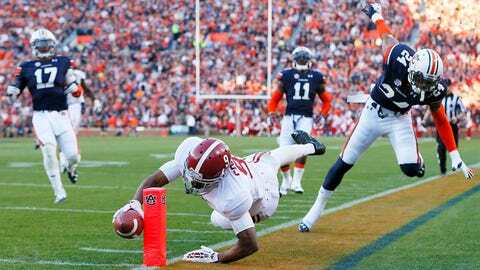 Those that were made in the Iron Bowl didn’t ultimately affect the game, because touchdowns were scored on subsequent plays, but if decisions are made that cost a team an SEC championship or the right to play in the national championship game, there would be a lot of hell to pay. Let’s look at the two plays that in question, both that were ruled touchdowns on the field and then were reversed in replay. Play 1: Alabama had the ball, first-and-10 at the Auburn 29-yard line with 4:10 left in the second quarter. Alabama led 14-7. Amari Cooper took the ball on a reverse and ran 29 yards, diving toward the end zone. It appeared that as he dove for the end zone, his hand landed out of bounds as the ball crossed the plane of the goal line. But after a replay review, the call was reversed and the ball was placed at the 1-yard line. This was the start of a real bad sequence for the replay official. Cooper tight-roped down the sideline, reached the ball inside of the pylon and his left hand touched out of bounds just as the ball broke the plane. That is a touchdown, folks. The ball was inside the pylon. The officials on the field made a great call. The replay official reversed it, and for the life of me, I can’t figure out why. The left hand touches out of bounds, but the tip of the ball crossed the plane. You want to say it was a 1/10th of an inch short — well that’s not obvious enough to overrule the ruling on the field. Play 2: Auburn had the ball, third-and-3 at the Alabama 16-yard line with1:53 left in the second quarter. Auburn quarterback Nick Marshall carried the ball for 16 yards and as he also tight-roped the sideline appeared to get in for the touchdown. After a review, the replay official reversed the call and the ball was placed at the 1-yard line. Play it again, replay. The same replay assistant reversed this call and said Marshall went out of bounds at the 2 and the ball crossed the sideline at the 1-yard line. He’s not even looking at the video if that was the case. Marshall does go out of bounds at the 1-yard line and steps out of bounds well beyond the plane, but he extended the ball with his right hand well inside the pylon. It was clearly a touchdown. By rule, when you go from in-bounds to out of bounds, you have to get the ball over or inside the pylon. The shot from behind clearly shows that Marshall was in for the touchdown. Once again, the officials made the correct call on the field. If I had to guess, I would say the replay official in the Iron Bowl will not work the SEC championship game. The SEC needs to find a solution to what happened in Saturday’s game. Either involve the referee, which I know the NCAA doesn’t want to do, or move replay inside so a replay expert in the conference’s command center can make the decision, because the right decisions aren’t being made by those being employed to make those decisions. This is the Iron Bowl. This is the biggest game of the year in the SEC. To have a two decisions botched like these are absolutely unacceptable and shows there are severe problems with replay in college football.